MCLAB's All-In-One 5X Reverse Transcription Mix Kit is optimized to synthesize the first strand cDNA for RT-PCR and RT-qPCR. MCLAB's QuantumScript™ HD Reverse Transcriptase is an engineered mutation with increased sensitivity, improved specificity, maximum thermostability and reduced RNase H activity. The optimal fist-strand cDNA synthesis temperature for this enzyme is 50°C. At higher temperatures the reverse transcription reaction improves cDNA yields for difficult RNA transcription. This Pre-mixed 5X concentrated solution includes all necessary components for the first-strand synthesis: 5X buffer, dNTPs, MgCl2, DTT, primers (optimized mixture oligo (dT) and random primers), RNase inhibitors, QuantumScript™ HD Reverse Transcriptase, It will simplify your first strand cDNA synthesis process. Figure 1. cDNA was synthesized in 20 µl for 30 minutes from 100 ng total RNA with different 5x All in one master mix. 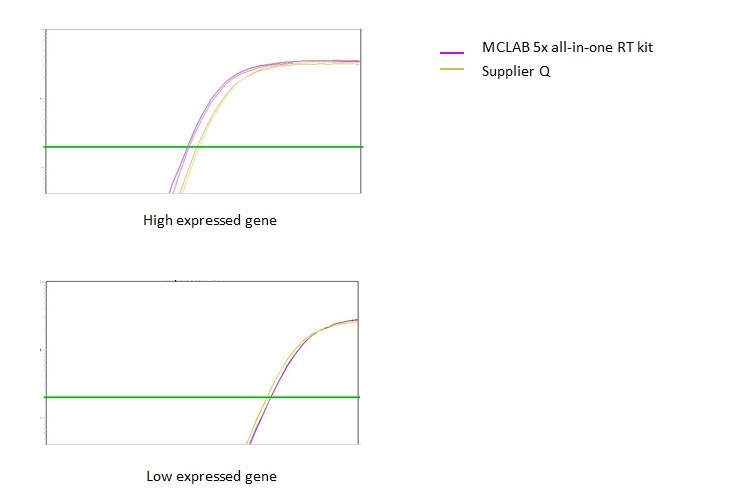 1 ul of cDNA was used for qPCR, The qPCR was performed in MClab 2x HotSybr qPCR system.